Our oceans are one of the most important resources on Earth, and yet many businesses treat them like a dumping ground, allowing poorly trained crews to make avoidable mistakes. Time and again we hear of chemical leakage, oil spills, sunken ships and other atrocities that wreak havoc on the ecosystem and lead to crewmember injuries. Last spring, the towing vessel Justice was heading to Buzzards Bay, MA, with five crew members on board when it ran aground just outside Hog Island Channel. The impact sliced the starboard stern drive from the tug and led to the ejection of over 200 gallons of gear oil. The vessel later docked without further incident using its port stern drive. Luckily, no one was injured. The National Transportation Safety Board found that the cause of the accident was probably the unsuccessful use of the ship’s autopilot system to stay on course in the channel, as well as waiting too long to take physical control as the tug approached clearly marked hazards. When a ship is designed and built, the behavior of the ship when subjected to the power of the ocean is pre-determined. All that careful planning goes overboard, however, if crewmembers are not properly trained in how to operate every part of the ship. 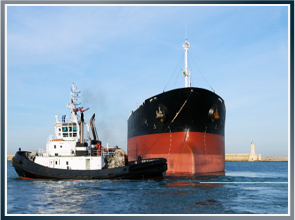 What Can I Do After a Tugboat Accident? Tugboat accidents like this are almost always avoidable. Crewmembers need better training in emergency situations. The owners of tow companies and other nautical services frequently try to cut corners and save money on safety training, and emergency facilities, and as a result, our waterways are repeatedly flooded with toxic sludge. If you have crewed a ship that was unseaworthy, please share your experience on our Facebook page. We want to hear your stories! The more we reveal the negligence of ship owners, the better our legacy to prevent accidents like these from happening to future generations. Next Is a Cargo Ship a Safe Option For My Trip Abroad?